Portal - Gives you access to all features relate to the portal side of your Operate system. Charges - Allows you to view and manage all charges that your business generates. Invoicing - Gives you access to invoices, accounts receivable and customer billing features. 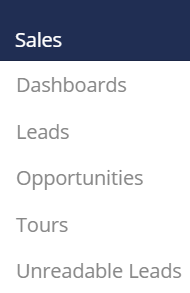 Sales - Takes you to your overall sales dashboards, leads, opportunities and tours. 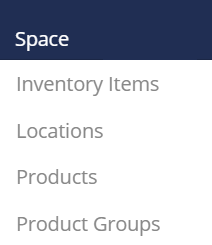 Space - Is where you will find your site locations, products and inventory items. Member - Allows you to manage your accounts, contacts and licences; as well as your email communication and client services. Reports is where you will find standard, predefined reports that you can use right away; and where you can also create your own, customized reports. Tasks allows you to manage tasks for different users of Operate, without needing to use an external tool. Calendars is where you can view and manage your meeting room bookings. Settings is where you will find global settings, for the different modules of Operate. Shout Outs - This is where you can post messages to your portal and make them accessible to everyone in your building. Announcements - Allows you to post announcements on your portal. Online Plans - Allows you to set up online packages that your customers can subscribe to, through the Portal. Promo Codes - Gives you the possibility to set up promotional codes that your customers can use to receive discounts or other benefits that you might want to provide. Portal Pages - This is where you can manage the pages that your Operate Member Portal contains. Batch Sheets is the section where you can manage the charges that you add within Operate and that need approval before being billed. Charge Sheets allow you to add charges to the system and bill them directly, without an approval process. Device Imports is where you can import a .csv file from an external application into Operate. For instance, when you want to charge customers for calls, here is where you might want to import a call logger file. 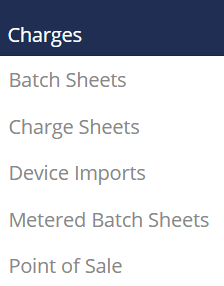 Metered Batch Sheets are charges that need approval and that are applied to metered services, such as electricity. This section is where you can manage them,. Point of Sale is where you can find a touch screen friendly interface that you can use to quickly process sales within your building. Accounts Receivable - This is where you can find everything related to your accounts receivable aspects - this is where you can manage outstanding invoices, process payments or give refunds. Credit Notes allow you to credit invoices back to customers when needed.This section lets you manage the final, approved Credit Notes. 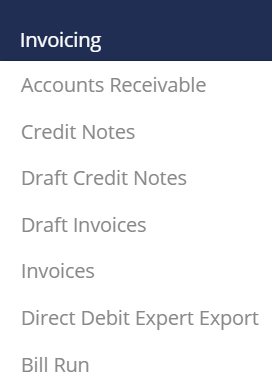 Draft Credit Notes - This is where Operate allows you to initially create your Credit Notes, before they are approved and finally processed onto the customer’s account. Draft Invoices is where you can find the invoices that are still in draft - they have not yet been approved and are subject to changes. This section allows you to view and manage them. Invoices - This section lists and allows you to manage finalized invoices that have been approved. This is where you can issue invoices to you customer. Bill Run is where you can automate the invoice creation process every time you need to do so,. The Bill Run allows you to pull charge related information from within Operate and create invoices based on it. Using the Bill Run, you do not need to create invoices for each individual customer; you can go through the process once and bill multiple customers in one go. Dashboards is a section where you can have a visual overview of your sales performance. Leads - This section gives you access to all your leads and their related information. This is where can create and manage your leads, as well as keep track of your brokers. Opportunities - Once your leads have been qualified, this is the section where they will be transferred. Here you have access to opportunity management features. Tours - Here is where you can find and manage all of your tour related information. This is where you can manage all prospects that request a tour of your workspace. Unreadable Leads is a section that gives you access to leads that the system cannot associate to a specific broker. Inventory Items - This is where you can view and manage the inventory items that are found within your workspace and that are being used by your customers. Locations is where you can find and manage all of the locations (buildings) that you provide workspace in. Products is the section that lets you manage al of the types of products that you are providing to your customers - either in the form of an actual product or as a service. Product Groups is the section that allows you to organize your products into groups. Accounts is the section where you can view and manage your accounts / your customers. Contacts - Gives you access to your list of contacts. Emails - Gives you access to email communication tools. This is where you will also find the emails that you have sent from within Operate. Email Campaigns is the section that allows you to send out emails to your customers. Group Accounts allows you to create a group that contains several customer accounts. This allows you to better organize and keep track of your data. Licences - Gives you access to your customers’ licences - these is where you would be able to find contract related information for each of the customers who are renting workspace from you on a long term basis. Mailing Lists is where you can manage lists of customers that you can use for email communication. Here is where you can view and manage any existing lists and set up new ones. Movement History - Gives you access to movements that customers might make in between your offices / locations. In the Reports section, you will find a list of predefined reports which you can run immediately; or you can create custom reports, based on your own needs. In the Tasks section, you will find a list of tasks that have been assigned to you or different members of your team. This is also where you can set up new ones. The Calendar is the tool that makes it easy for you to manage meeting room bookings. It gives you a visual overview of your bookings, showing their status and their date and time. Here is where you can quickly add new bookings or edit existing ones. All features related to bookings management are available here. The Settings section is where you can find and manage different parameters for each of your Operate modules.